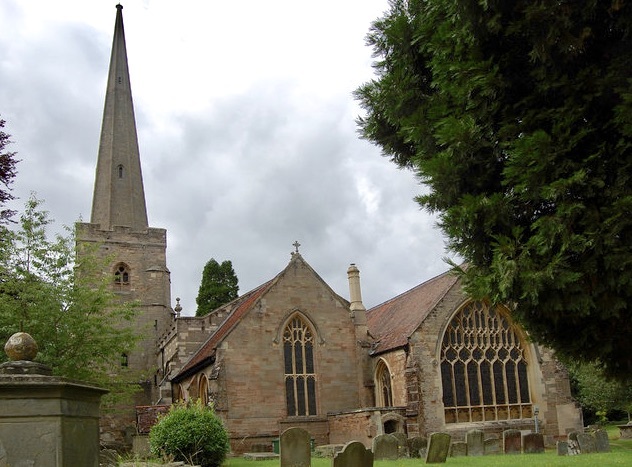 NEWENT ST MARY is located in Church Street and dates from the 13th century. Of particular interest is the ceiling, made from Forest of Dean timber, and is the largest unsupported wooden ceiling in the whole country. The spire reaching 150 feet high has been replaced and repaired numerous time; it sits on top of a 14th century tower. The last restoration was in 1968. In the porch is a cross shaft thought to date from the 9th century. It was found in the churchyard in 1907. Perhaps the most serious damage to the church occurred in the 17th century when weight of snow caused thr roof over the nave to collapse. The list below shows the baptisms, marriages and burials that took place at Newent, in Gloucestershire. Edmund Bergum 19 Mar 1681 Newent Baptism Thomas Jackman (1) f=Thomas Bergum FF? Joane Bergum 29 Aug 1682 Newent Marriage Thomas Jackman (1) m=William Morgan FF? Elizabeth Bergum 30 Dec 1682 Newent Baptism Thomas Jackman (1) f=Thomas Bergum FF? Thomas Bergum 17 May 1685 Newent Baptism Thomas Avenant (2) P=Thomas + Elizabeth FF? Mary Bergum 17 May 1685 Newent Baptism Thomas Avenant (2) P=Thomas + Elizabeth FF? Mary Bergum 28 Apr 1690 Newent Burial D. Thomas FF? Daniel Bergum 09 Mar 1691 Newent Baptism Thomas Avenant (2) P=Thomas + Elizabeth FF? Daniel Bergum 28 Mar 1691 Newent Burial S. Thomas P=Thomas + Elizabeth FF? Nathaniel Bergum 10 Nov 1692 Newent Baptism Thomas Avenant (2) P=Thomas + Elizabeth FF? Hannah Bergum 01 Jan 1695 Newent Baptism Thomas Avenant (2) P=Thomas + Elizabeth FF? Thomas Bergum 11 Sep 1698 Newent Burial FF? Elizabeth Bergum 23 Jan 1717 Newent Burial Widow FF? Mary Burgam 28 Jan 1720 Newent Marriage Thomas Avenant (2) m=Francis Huggins FF? Sarah Burgum 07 Sep 1748 Newent Baptism James Griffith (3) P=Edmund + Mary FF? Mary Burgum 16 Mar 1750 Newent Baptism James Griffith (3) P=Edmund + Mary FF? Anthony Burgum 21 Feb 1837 Newent Burial James Archibald (4) Age 37 FF? Charles Burgum 26 Jul 1844 Newent Baptism James Archibald (4) P=Robert + Elizabeth FF? (1) Thomas Jackman was vicar of the Parish Church at Newent fron December 1663 until his death on 24th March 1691. (2) Thomas Avenant was educated at New Inn College, Oxford, receiving a BA in 1691. He was ordained as a priest in December 1669 and a priest in December 1670. He was rector at Avon Dassett, Coventrey and Lichfield, in 1676 and was operating as a curate at Newent from 1685, becoming the vicar there in March 1691. He remained there until his death on 6th June 1728. (3) James Griffiths, MA, became vicar of Newent in August 1737 and continued there until his death 20th February 1762. (4) James Archibald ordained as a deacon in 1825 and as a priest the next year. he became Stipendiary Curate at Llanbister in November 1825, before moving to Newent in May 1827. (5) Newent had long associations with the Onslow family, who were related to the highly successful Foley family, with their interests in iron mining and production. Archdeacon Onslow being vicar of Newent for 47 years until his death in 1849. His son, R.F. Onslow was Lord of the Manor and lived at Stardens Manor, which he greatly enlarged in 1822/3. He died in 1879. (6) Rev. Edward henry Sankey was educated at Oriel College, Oxford. He campaigned for funds to build the Gorsley with Clifford's Mesne school church. It was opened in 1872, with a chancel added in 1877; a residency for the clergyman was also built in 1876. Rev. Edward Sankey became the incumbent there.